It’s Time for the Main Event—Rastakhan’s Rumble™ Now Live in Hearthstone® | Activision Blizzard, Inc.
IRVINE, Calif.--(BUSINESS WIRE)--Dec. 4, 2018-- Hearthstone® players from across Azeroth are packing into the Gurubashi Arena alongside rowdy crowds and eager troll contenders for today’s launch of Rastakhan’s Rumble™,the newest expansion for Blizzard Entertainment’s smash-hit digital card game—which recently passed the 100-million-player mark*! Rastakhan’s Rumble thrusts players into a rough-and-tumble fight for glory with 135 new cards and a mojo-fueled arsenal of new mechanics. The trolls of Azeroth have gathered at the behest of their leader, King Rastakhan, for a once-per-generation, no-holds-barred throwdown. 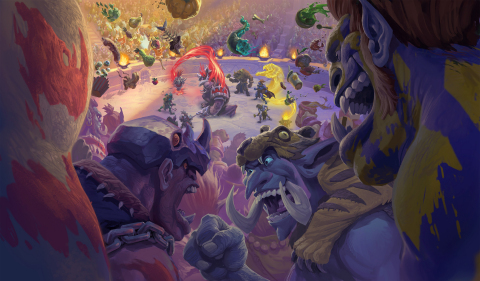 Nine teams have formed, led by some of the most fearsome fighters of trollkind—nineLegendary Troll Champions, each representing a Hearthstone class. Combatants will enjoy the blessings of their team’s Loa, ancient spirits venerated by the trolls that have manifested themselves as Legendary minions. Players looking to dive deeper into the magic of the trolls can call forth Spirits—unique class-specific minions that share impressive synergies with the Loa. Those more inclined to thrilling the crowd with sheer brutality can do so with Overkill cards—a new gameplay mechanic that rewards players with powerful effects when they deal excess damage. For a limited time, players who log in to Hearthstone will receive six free Rastakhan’s Rumble card packs, as well as three cards to kick-start new deck-building ideas: arandom Legendary Loa minion and two copies of a rare Spirit minion from the same class as their Loa.